IF YOU HAVE A WEAK STOMACH WE ADVISE YOU TO READ THIS IN THE COMPANY OF A PSYCHIATRIST AND THE AMBULANCE IN WAITING. Joe Hockey delivers his first Budget to parliament. 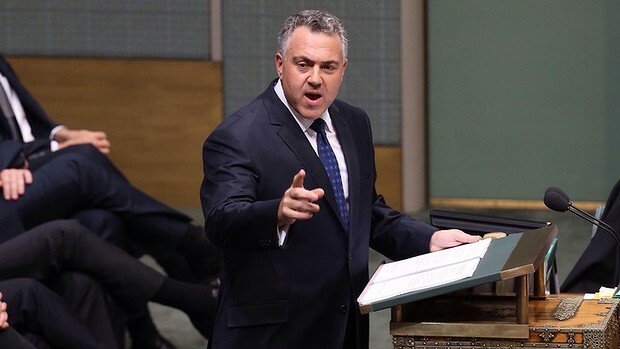 The following is the full text of the 2014 budget speech delivered by Federal Treasurer Joe Hockey. Madam Speaker, I move that the bill for the budget be now read a second time. Our future depends on what we as a nation do today. government's solemn duty is to build a stronger Australia. This budget will help build a more prosperous nation. Every generation before us has contributed to the quality of life that we enjoy today. Prosperity isn't a matter of luck. So now it is our turn to contribute. Now it is our turn to build. This challenge is not of our making, but we, the women and men behind me, accept responsibility to fix it. Doing nothing is not an option. The days of borrow and spend must come to an end. It is time, for all of us, to contribute and build. From this effort, there will be benefits for jobs, for higher education, for health and for those in genuine need. will underpin the health system of the future. security capability, that keeps our nation safe for decades to come. We are a great nation and now is our chance to be even better. We know that for some in the community this budget will not be easy. But this budget is not about self-interest. This budget is about the national interest. Our Economic Action Strategy is not about weakening government; it is about redefining the role of government in people's lives. The age of entitlement is over. It has to be replaced, not with an age of austerity, but with an age of opportunity. This is not the time to talk our country down, but it is the time to face the facts. it tough because the economy is growing at less than its normal speed. Unemployment is too high with over 700,000 Australians looking for a job. Without change, the budget would never get to surplus and the debt would never be repaid. So the time to fix the budget is now. The time to strengthen the economy is now. The time for everyone to contribute is now. I say to the business community we need you to help out. large and small, can create more jobs in Australia. effort on innovation and self-reliance. Businesses should stand or fall on their ability to produce the goods and services that people actually want. abolishing the carbon tax and we are abolishing the mining tax. new free trade agreements with Korea and Japan. Tonight we are asking higher-income earners to help repair the budget. people earning more than $180,000 a year. It is only fair that everyone makes a contribution. This includes members of parliament. former and current MPs before the scheme is abolished. As I said, we all must contribute. Pensions are a significant source of income for almost four million Australians. We promised at the last election not to change pensions in this term of government and we won't. linked twice a year to inflation. almost $1.1 million in assets also qualify for the age pension. between now and 2017, but then remain at fixed levels for three years. We should celebrate the fact that Australians are living longer but we must prepare for the adjustments in our society. income test for new recipients of the Commonwealth Seniors Health Card. Supplement will be abolished from 1 July this year. and most Medicare fees will also be paused. Surprisingly, around three-quarters of families receiving family assistance receive both Part A and Part B payments. The Family Tax Benefit Part B income threshold will be reduced to $100,000. also keep the associated tax cuts. Since coming to office, we have carefully and methodically looked at all areas of government spending. The government has also decided to abolish over 230 bureaucratic programs. being abolished to deliver better value for taxpayers. government is reduced or removed. I say to the Australian people, to build a workforce for the future, those who can work, should work. The benefits of work go far beyond your weekly pay packet. Work gives people a sense of self, and work helps to build a sense of community. That is why young people should move into employment before they embark on a life on welfare. Australians under 30 years of age should be earning or learning. Dole, to be eligible for income support. $20,000 over a four-year apprenticeship. get the same fair go. Parental Leave Scheme will help keep mothers engaged with the workforce. family's youngest child turns six and is at school. Staying at home should be a parent's choice but there are limits on how much support the taxpayer can give. be for older Australians to find a job. There needs to be a change in the culture of many businesses towards older workers. Employers can use these funds to assist employees to reskill and play a more active role in the workforce. We must build an education and training system that becomes the envy of the world. Along with supporting young people learning a trade, we want to build a country that values all levels of education. This will deliver the best skills for the task ahead. Australia should have at least one university in the top 20 in the world, and more in the top 100.
world. We need to set our sights higher. existing arrangements will remain until the end of 2020. With greater autonomy, universities will be free to compete and improve the quality of the courses they offer. still be eligible for concessional higher education loans. workforce earning over $50,000 a year. from disadvantaged backgrounds who want to attend university. One of our greatest strengths as a nation is our capacity to innovate and invent. And our medical researchers have led the way, from Howard Florey to Sir Gustav Nossal and from Fiona Stanley to Ian Frazer. Australians have, through research and innovation, saved millions of lives, not just here but around the world. Tonight, I announce the government's commitment to build with your contributions, a $20 billion Medical Research Future Fund. This fund will, within six years, be the biggest medical research endowment fund in the world. this 'Health Budget', until the fund reaches $20 billion. Health services have never been free to taxpayers so patients are being asked to make a modest contribution towards their cost. have safety net provisions for concessional patients and children. Australians are always prepared to make a reasonable contribution if they know their money is not wasted. our people for our people. From next year, funds will start flowing from the Medical Research Future Fund into new medical research. The first duty of a government is to protect our people and strengthen our borders. government will have a new strategic plan for the defence of the nation. smugglers now understand that the door to our nation is closed. This year not a single people-smuggling venture has successfully landed in Australia. This has meant savings of $2.5 billion to the budget, and the closure of nine detention centres. Everything I have announced tonight helps to build a stronger budget and a stronger economy. There is no easy way to repair the budget. We have been at pains to reduce government expenditure without hurting the economy. Taxpayer spending needs to be reprioritised, where possible, into job stimulating investment like roads and rail. We also need to have more stability in taxation policy. otherwise have been the case. The changes to the budget I have announced tonight will significantly improve the budget bottom line. Our decisions have contributed $36 billion towards this improvement. work that still needs to be done. is after we prudently budget for future taxation relief. Over the last decade we have been blessed with a mining boom and the highest terms of trade in 140 years. and resources boom has come from new foreign investment in Australia. of the heavy lifting over the decade. So now we need to fire up the rest of the economy. Tonight, I am announcing a package of measures that will significantly increase investment in infrastructure across Australia. Over the next six years, the government will help build new roads, rail, ports and airports. This new infrastructure will drive and support the next wave of national prosperity. Our Growth Package will take the government's total investment to $50 billion by the end of the decade — the largest on record. This money will drive over $125 billion of spending on new infrastructure across the continent. Over the longer term this is expected to permanently boost the size of the economy by one per cent. These projects will mean real activity and real jobs in local communities. Shovels will start moving within a matter of months. The $18 billion East West Link in Melbourne starts work before Christmas and will create 6000 new jobs. Adelaide. This will create thousands of new jobs across our nation. This will improve living standards across the country. linked by law to the road-building budget. This will ensure that there is a stable and growing source of funds to support long-term investment in Australia's roads. Budget speeches are often about numbers, and appropriately so, but the budget must always be about people. I say to the Australian people, every dollar we spend in this Parliament comes from you. If we can get on with the job of fixing this budget, then you and your family will benefit. We will all share in more jobs, greater wealth and greater prosperity. But unless we fix the budget together, we will leave the next generation a legacy of debt, not opportunity. As Australians, we must not leave our children worse off. We are a nation of lifters, not leaners. So tonight, we present you with a budget that delivers a sustainable future for your children, and the generations beyond. We are a great nation. We are a great people. By everyone making a contribution now, we will build, together, a better Australia. I commend the Budget Bill to the House.